Red light therapy is additionally referred to as low-level laser therapy (LLLT). It utilizes low-energy light emitting diodes (LEDs) or lasers as an alternative treatment for pain relief, or to promote good cell functions. This therapy doesn’t use high power lasers which can harm tissues. Specific wavelengths of lasers are successful in applications such as increased recovery with wound healing, treating acne, and diminishing the symptoms of restless leg syndrome. There are a number of diverse ways that you can cater yourself with red light therapy. Skin care clinics like us (Mederm Esthetics & Laser Clinic) offer red light therapy. A great thing to know about red light therapy is that it does not release dangerous ultraviolet (UV) radiation. Another way that red light therapy can be distinct is with the actual light used. Often nowadays, LEDs are utilized, but low-energy lasers can also be used. The light utilized can be different between machines, with distinct wavelengths being discharged, such as infrared light. Distinct wavelengths can influence different symptoms distinctively, so it is beneficial to discover which wavelength is best suited to cater to your condition. The notion of red light therapy can be seen as a human variant of the way plants photosynthesize. It has been said that certain wavelengths of light can increase the notion of mitochondria, which are the organelles in a cell which absorb nutrients and break them down to manifest energy molecules for the cell. By amplifying the cellular respiration, it will enhance the functioning of the entire cell. Applying heat to a joint can minimize stiffness by as much as 20%, and effects of red light therapy are thought to be the same. This can have a great pain-reduction outcome as decreased stiffness and pain can stimulate you to use a joint excessively, which can decrease added stiffness. The body’s innate reaction to heat is to amplify blood vessels. The same thing occurs when exposed to red light. This broadening of blood vessels diminishes defiance to the blood flow, hence repairing the speed at which it can move within the body. This is an excellent benefit because the restriction of blood flow can produce cells to be hungry for oxygen. Lack of oxygen can enduringly harm tissues, especially in the muscles as it can destroy cells, some of which cannot be recovered. The improved blood flow is the main reason that inflammation is reduced with red light therapy. This reduces and eliminates the production of fluids which can cause edema, therefore reducing pain linked with swelling and can even fix the healing mechanisms. 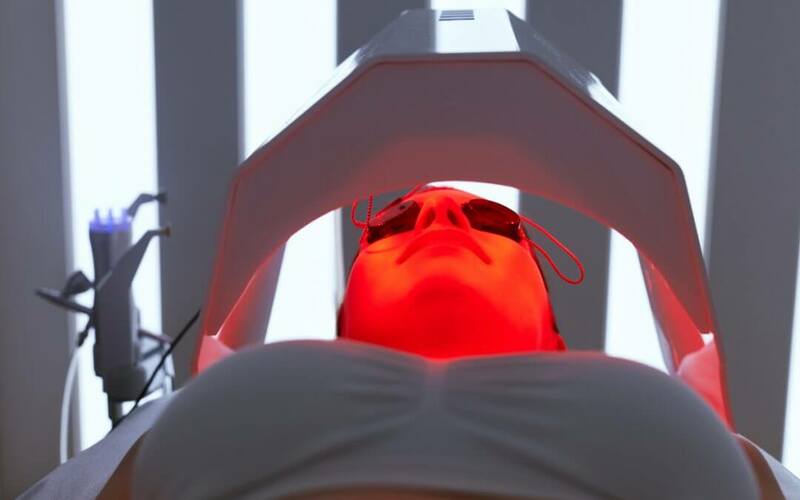 Red light therapy at 640 nm wavelength is thought to kindle the productions of collagen and elastin fibers, as well as the production of new capillaries. A bigger number of capillaries within the skin will enhance blood flow to the skin tissues and also the transportation of oxygen and nutrients to the cells, whilst the extra collagen and elastin will smooth out the skin. This can slow down and diminish the signs of aging on the skin, providing a more youthful look. Red light therapy can treat acne since it can repair circulation and inflammation through the energy transfer. This means that harmful, swollen spots may be diminished in size. It is also known that it can diminish oil glands and evidently diminish oil that is produced. Red light can also be used together with blue light to treat acne. While the red light is decreasing the visual effects of acne by eliminating swelling and pain, the blue light can destroy particular types of noticeable bacteria. When used simultaneously, the two types of light therapy will amazingly reduce and prevent more breakouts.